When the summer heat is on, the best way to keep cool is to hit the waterparks. Besides the permanent thrilling waterslides and Water Play Parks in Sydney, there are some awesome pop-up water playgrounds this summer. Here is our guide to the best waterparks for kids and families. More Info about Waterworld Central. A mobile water park is coming to Moore Park, where children aged 2-16 will enjoy Shark World, Dragon Pool, Dolphin Slide, a wading pool, a Hippo Slide and running on water inside Water Zorb balls! Epic inflatable fun! Parents are invited to Dino Slide for some water fun too. 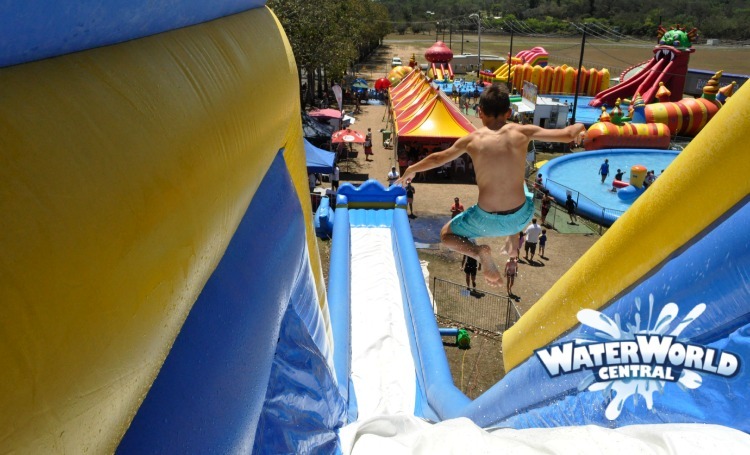 A mobile water park is coming to Bateau Bay, where children aged 2-16 will enjoy Shark World, Dragon Pool, Dolphin Slide, a wading pool, a Hippo Slide and running on water inside Water Zorb balls! Epic inflatable fun! Parents are invited to Dino Slide for some water fun too. Visit Sydney’s best water park with its impressive collection of massive slides, 10 kid-friendly water slides including miniature versions of the larger slides like T5 and the H2GO Racers and Nickelodeon Beach, a wonderful play area for under 5s, with water slides perfect for mini-adventurers. There is also a splash play area, a huge beach and a massive wave pool. New to summer 2016-17 is the Dinosaur Lagoon where you will come face to face with fierce and interactive creatures from the prehistoric past, more umbrellas throughout the park, Tap’n’Play so you can wait less and play more, and more cafe and dining options. We are particularly excited for Cinema in the Sand, the FMX Showtime Summer Slam and the Live Summer Music Series. Moany of these waterparks are leaving the city by the end of January, but there’s still a great selection of water slides for kids in Sydney all year round. Find out where they are here.